Here's a mystery. I came across this illustration on an Australian website, but the author of the site fully admitted that he did not keep track of his images, and could not say where he drew this from. I am at a loss as to its origin. With reservation, I include this image, as it appears to be an original. Even so, I am somewhat reluctant. If you have any information regarding the origins of this image, I would be greatly appreciative! 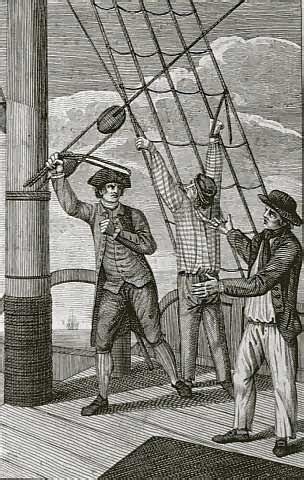 In this image, a merchant officer swings a colt or cat at the back of a sailor tied to the rigging. The merchant officer, interestingly enough, is dressed in a largely unremarkable suit, save for the mariner's cuffs. His victim wears a cap, a striped shirt, and dark trousers that end at his ankles. Further aft stands a Jack with his hands outstretched as his implores the officer to cease his beating. He wears a round hat with a short brim, a black neckcloth, no waistcoat, a double breasted short jacket with lapels and mariner's cuffs, and a pair of trousers. His shoes have rectangular buckles. EDIT: Mystery solved! Check back for an examination of the original print: "Captain James Lowry flogging and murdering Ken'th Hossack."